Used in MR imaging of liver. Literature References: Intravascular paramagnetic MRI contrast agent. 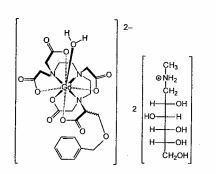 Prepn: E. Felder et al.,EP230893; eidem,US4916246(1987, 1990 both to Bracco); F. Ungerri et al.,Inorg. Chem.34, 633 (1995). HPLC determn in biological samples: T. Arbughi et al.,J. Chromatogr. B713, 415 (1998). Physicochemical properties: C. de Haen et al.,J. Comput. Assist. Tomogr.23, Suppl. 1, S161 (1999). Pharmacology: P. Tirone et al.,ibid. S195. Pharmacokinetics: V. Lorusso et al.,ibid. S181. Toxicology: A. Morisetti et al.,ibid. S207. Clinical study in MRI of liver lesions: J. Petersein et al.Radiology215, 727 (2000). Review of clinical studies: B. Hamm et al.,J. Comput. Assist. Tomogr.23, Suppl. 1, S53-S60 (1999). Properties: Hygroscopic powder. mp 124°. Freely sol in water, sol in methanol. Practically insol in n-butanol, n-octanol, chloroform. Abs max 257.8 nm (e 203). [a]36520 -26.9° (c = 1.45 in water). Prepd as 0.5M soln, osmolality (37°) 1.97 mol/kg. d20 1.22. Viscosity (mPa.s): 9.2 (20°), 5.3 (37°). LD50 i.v. in mice (mmol/kg): 5.7 (at 1 mL/min), 7.9 (at 0.2 mL/min); LD50 i.v. in rats (mmol/kg): 6.6 (at 6 mL/min), 9.2 (at 1 mL/min) (Morisetti). Therap-Cat: Diagnostic aid (MRI contrast agent). Keywords: Diagnostic Aid (MRI Contrast Agent). Gadolinium-Based, paramagnetic contrast agent launched by Bracco in 1998 for use in magnetic resonance imaging (MRI). Gadobenate Dimeglumine is a gadolinium-based paramagnetic contrast agent. When placed in a magnetic field, gadobenate dimeglumine produces a large magnetic moment and so a large local magnetic field, which can enhance the relaxation rate of nearby protons; as a result, the signal intensity of tissue images observed with magnetic resonance imaging (MRI) may be enhanced. Because this agent is preferentially taken up by normal functioning hepatocytes, normal hepatic tissue is enhanced with MRI while tumor tissue is unenhanced. In addition, because gadobenate dimeglumine is excreted in the bile, it may be used to visualize the biliary system using MRI. Gadobenate Dimeglumine is an MRI contrast agent used primarily for MR imaging of the liver. It can also be used for MRI of the heart, as well as and central nervous system in adults to visualize lesions with abnormal brain vascularity or abnormalities in the blood brain barrier, the brain, spine, or other associated tissues. Gadobenate Dimeglumine is an MRI contrast agent used primarily for MR imaging of the liver. It can also be used for visualizing the CNS and heart. In contrast to conventional extracellular fluid contrast agents, gadobenate dimeglumine is characterized by a weak and transient binding capacity to serum proteins. This binding leads to an increased relaxivity of gadobenate dimeglumine and, consequently, to a considerably increased signal intensity over that of other agents. Gadobenic acid (INN, trade name MultiHance) is a complex of gadolinium with the ligand BOPTA. In the form of the methylglucaminesalt meglumine gadobenate (INNm) or gadobenate dimeglumine (USAN), it is used as a gadolinium-based MRI contrast medium. BOPTA is a derivative of DTPA in which one terminal carboxyl group, –C(O)OH is replaced by -C–O–CH2C6H5. Thus gadobenic acid is closely related to gadopentetic acid. 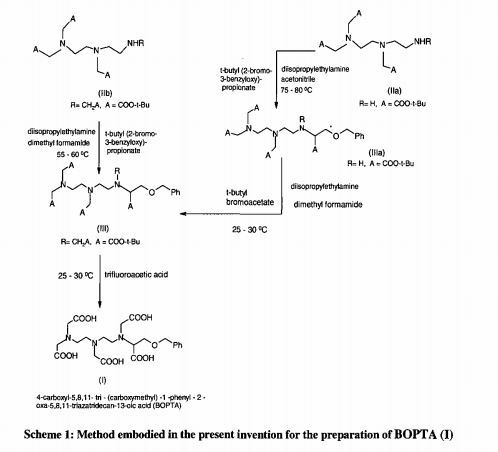 BOPTA itself was first synthesized in 1995. In the “gadobenate” ion gadolinium ion is 9-coordinate with BOPTA acting as an 8-coordinating ligand. The ninth position is occupied by a water molecule, which exchanges rapidly with water molecules in the immediate vicinity of the strongly paramagnetic complex, providing a mechanism for MRI contrast enhancement. 139La NMR studies on the diamagnetic La-BOPTA2− complex suggest that the Gd complex maintains in solution the same kind of coordination as found, by X-ray crystallography, in the solid state for Gd-BOPTA disodium salt. Gadolinium-based contrast agents are commonly used to improve visibility of internal structures when a patient undergoes magnetic resonance imaging (MRI). These agents are typically administered intravenously immediately prior to imaging. Many contrast agents used in MRI cause toxicity in various areas of the body if they are not excreted rapidly by the kidney. These include for example, chelated organic gadolinium compounds which are not nephrotoxic in themselves, but which if retained in the body for extended periods of time release gadolinium ions which are toxic to various organs and cells of the body including skin, nerves, etc. The problems particularly occur in patients who are at risk for reduced kidney function. Serious diseases including nephrogenic systemic fibrosis (NSF) are among the consequences of this problem. (see, for example, Briguori et al., Catheter Cardiovasc. Intery (2006) 67(2): 175-80; Grobner et al., Kidney Int. 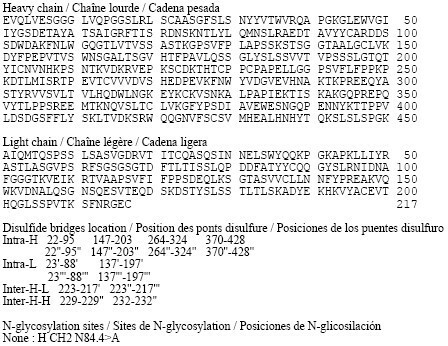 (2007) 72(3): 260-4; Nortier et al., Nephrol. Dial. Transplant (2007) 22(11): 3097-101). The FDA requested a boxed warning for contrast agents used to improve MRI images on May 23, 2007 stating that patients with severe kidney insufficiency who receive gadolinium-based agents are at risk for developing NSF, a debilitating and potentially fatal disease. In addition, patients just before or just after liver transplantation, or those with chronic liver disease, are also at risk for developing NSF if they are experiencing kidney insufficiency of any severity. The boxed warning is now included in each of the five gadolinium-based contrast agents currently approved for use in the United States. Thus, a need exists to reduce the toxicity that is caused by contrast agents in patients with risk factors for compromised renal function. Example 1 were added to the vessel IOOmL 7. 7gBOPTA and 4. 2g thirty-two gadolinia weighed, followed by addition of 47mL water for injection, stirring and heated to 60 ° C. After incubation the reaction at this temperature for 1.5h, added the same amount in ten batches 5.77g meglumine. After each addition was complete meglumine, taking a small sample using a pH meter to monitor the reaction solution pH. If the sample pH <6. 9, the reaction was continued until the reaction solution was added next batch PH interposed between Meglumine 6.9 ~ 7.3. After the addition of meglumine, the reaction was continued heating and stirring 1.5 hours. Followed by addition of decolorizing charcoal 〇.16g pharmaceutically acceptable, holding the temperature, stirred for 1.5 hours. Finally hot filtration, the filtrate was collected, concentrated in vacuo to give a white solid 14. 2g. Example 2 were added to the vessel IOOmL 7. 7gBOPTA weighed and 5. Ig trioxide followed by addition of 68mL of water for injection, stirring and heated to 65 ° C. After incubation the reaction I. 5h at that temperature, was added an equal amount of sub-batches twelve 6. 24g meglumine. After each addition was complete meglumine, taking a small sample using a pH meter to monitor the reaction solution pH. If the sample pH <6. 9, the reaction was continued until the reaction solution was added at a pH between batch Meglumine between 6.9 ~ 7.3.After the addition of meglumine, the reaction solution and heating was continued for 2 hours. Followed by addition of decolorizing charcoal 〇.23g pharmaceutically acceptable, holding the temperature, stirring for 2 hours. Finally hot filtration, the filtrate was collected, concentrated in vacuo to give a white solid 14. 8g. Example 3 were added to the vessel IOOOmL 77gBOPTA weighed 42g and gadolinium oxide, followed by addition of 470mL injection water and heated with stirring to 60 ° C. After incubation the reaction at this temperature for 2h, the same amount was added in ten 58g batches meglumine. After each addition was complete meglumine, small sample, monitoring the reaction solution with a PH meter pH. If the sample pH <6. 9, the reaction was continued until the reaction solution was added next batch PH interposed between Meglumine 6.9 ~ 7.3. After the addition of meglumine, the reaction solution and heating was continued for 2 hours. Followed by addition of 2. 5g medicinal charcoal decolorization, holding the temperature, stirring for 2 hours. Finally hot filtration, the filtrate was collected, and concentrated to give a white solid 131g. Magnetic resonance imaging (MRI) is a tomographic image, which is obtained using a magnetic resonance phenomenon of electromagnetic signals from the body, the body information and reconstructed. Currently in clinical use development speed is very fast, widely used in nerve, spinal cord, heart and great vessels, joint bone, soft tissue and pelvic enhanced prosecution, has a three-dimensional object to be measured non-destructive and can perform high-resolution imaging and so on. paramagnetic contrast agent is a contrast agent suitable for diagnostic magnetic resonance imaging (MRI), and into the body tissue can shorten the imaging time of protons, thereby enhancing the image sharpness and contrast. The paramagnetic contrast agents include Gd-DTPA and gadobenate dimeglumine. Patent No. US5733528 discloses a metal chelate Gd-DTPA is applied to a magnetic resonance imaging (MRI) imaging study based on human organs; CN100325733C Patent discloses a gadolinia and diethylene triamine pentaacetic acid (DTPA) complex , to give after separation of gadolinium diethylenetriamine pentaacetic acid (Gd-DTPA), Gd-DTPA method of re-chelated meglumine obtained. gadobenate dimeglumine gadolinium DTPA derivatives, widely used as paramagnetic contrast agents for magnetic resonance imaging. Clinical research shows that traitor, compared to Gd-DTPA, Gd Tony dimeglumine showed obvious advantages in terms of allergy, side effects and efficacy and so on. 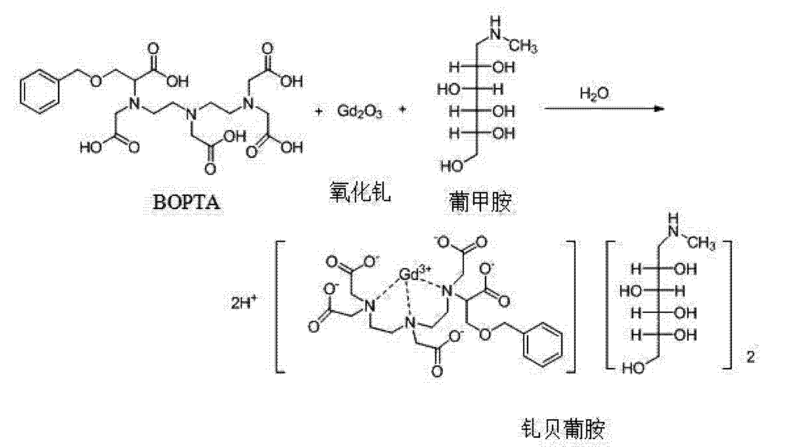 Moreover, Gd-DTPA was prepared using the purified and then after intermediate isolation, reacted not only with the stepwise synthesis of certain other compounds prepared by reacting the starting material many steps, long reaction period, and intermediate separation and purification operation complicated and likely to cause loss of product increased production costs. Therefore, the development of a simple method of synthesis Gadobenate dimeglumine is of great significance. From Investigative Radiology (1990), 25(Suppl. 1), S59-S60. Jump up^ Sweetman, Sean C., ed. (2009). “Contrast Media”. Martindale: The Complete Drug Reference (36th ed.). London: Pharmaceutical Press. p. 1478. ISBN 978-0-85369-840-1. ^ Jump up to:a b Uggeri, F.; Aime, S., Anelli, P.L., Botta, M., Brocchetta, M., De Haën, C., Ermondi, G., Grandi, M., Paoli, P. (1995). “Novel contrast agents for magnetic resonance imaging. 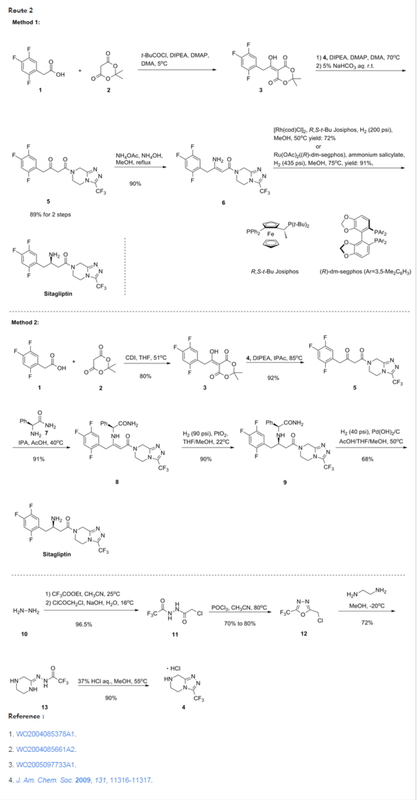 Synthesis and characterization of the ligand BOPTA and its Ln(III) complexes (Ln = Gd, La, Lu). X-ray structure of disodium (TPS-9-145337286-C-S)-[4-carboxy-5,8,11-tris(carboxymethyl)-1-phenyl-2-oxa-5,8, 11-triazatridecan-13-oato(5-)]gadolinate(2-) in a mixture with its enantiomer”. Inorg. Chem. 34 (3): 633–642. 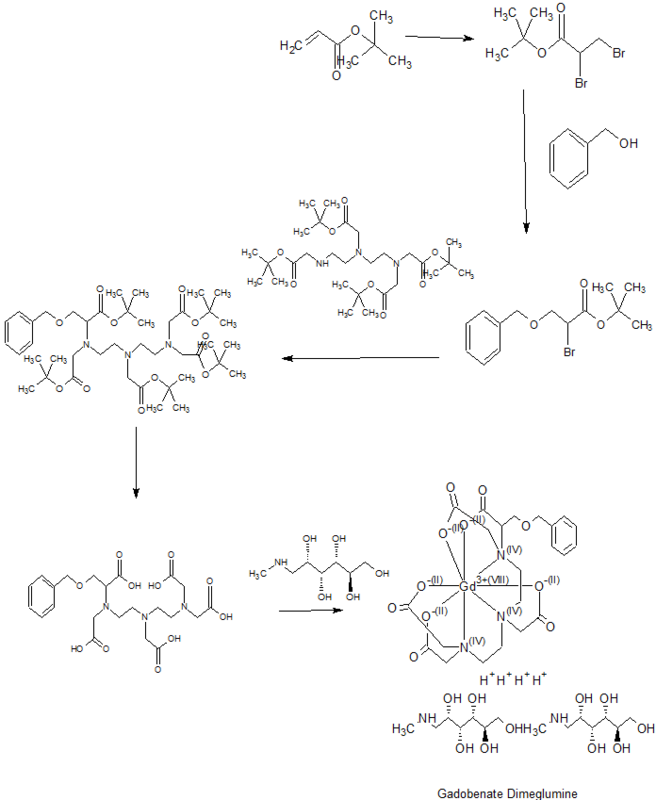 doi:10.1021/ic00107a017. By DR ANTHONY MELVIN CRASTO Ph.D in Contrast agent on June 12, 2018 .